As a marine biologist I am often asked what is the greatest threat to the oceans. It’s a easy answer: global warming. As a surfer I am surprised how few surfers seem to know, or care, about our assault on the oceans. 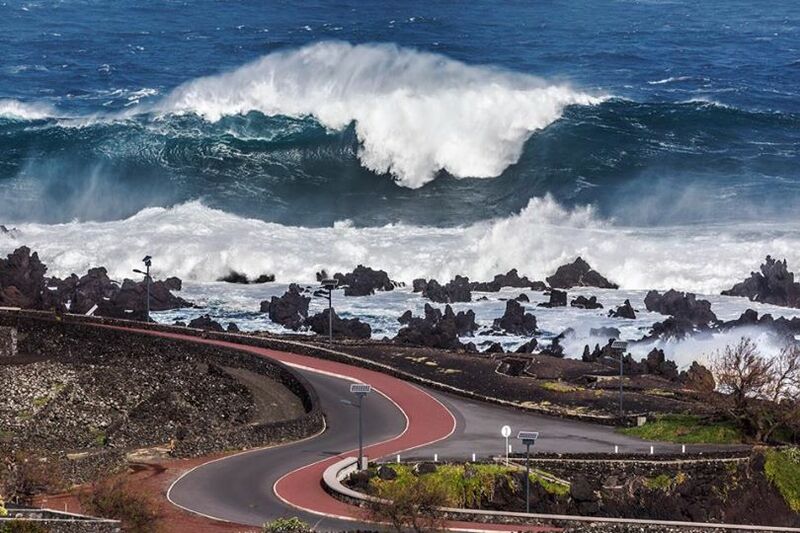 I am often met with “why should I care” or worse: “the surf will get better, so what?” Here’s a typical example. This is a very narrow view of both the complexity of climate change, the ocean, and the world, and I feel compelled to speak up as a surfer and a scientist, and the discuss the most recent scientific evidence of what global warming, and more broadly, global climate change, means to surfers and the ocean. As the proverbial frog will jump out of boiling water but endure water that is slowly warming until it dies, a current analogy is that if a comet or asteroid hit the planet, such as in the movie Deep Impact or Armageddon, and altered the planet’s temperature, acidified the oceans, and raised sea levels, we would all be terrified at the consequences to us and our way of life. In reality, and this is the challenge of our time, this is exactly what is happening, but so slowly that it will take decades to be fully felt. But fully felt it will be. That is unless we do something! A change in sea level may reset growth of sandy bottoms on continental shelves for thousands of years before these ecosystems reach a new dynamic equilibrium (Graham et al., 2003). All this adds up to the fact that many surf spots will change as the swell height, direction, and sea level shift and extreme weather events alter coastline geomorphology. This is most likely for sandy beaches as sea level rise and larger swells erode coastlines and alter local sediment dynamics. Will other new surf spots be created? Possibly, but do you really want to lose your favorite surf spot? Reef breaks will also change as sea levels rise over the next few decades and paleoecological studies suggest we will transition from fewer productive rocky reef habitats to a larger number of less productive sandy shores (Graham et al., 2003). As I discuss below, coral reefs are particularly vulnerable to global climate change. Overall, the future impact to surfing is likely to be significantly negative. 2. The ocean will experience profound change, for a long time, Look, the physics is simple: dump 35 billion metric tons of carbon dioxide in the atmosphere every year and you change the climate of the planet. Guaranteed. There is no place for it to hide: from the bottom of the ocean to the upper rim of the atmosphere our carbon footprint is felt, profoundly, and our climate will respond. Remember, climate is not weather, it is not the day-to-day or even year-to-year ups and downs but the overall long-term trends in earth’s temperature, precipitation, etc. What we are doing is creating a rapidly changing planet with carbon dioxide levels not seen on the planet in a long, long time. In fact, to find an earth with an atmosphere comparable to where we are heading by 2100 you have to go all the way back to the the Eocene period, 50 millions year ago, Our relatively short, but very intense, influx of greenhouse gases is changing the earth’s interactions among living organisms, biogeochemical cycles, ice cycles, and other aspects of planetary dynamics, that will irreparably change the planet for a long time. Based on a conservative future of carbon emissions (IPCC IS92a), one where we do something about future emissions but not as much as we can, sophisticated computer simulations indicate that carbon dioxide peaks at ~1000 ppm (parts per million) in the atmosphere just after year 2100 (we are currently above 400 ppm; but were 280 ppm in 1870 prior to the industrial revolution). Given this scenario mean global sea surface temperatures (SSTs) increase by about 5°F, reaching a maximum just before year 2200, and remain elevated above current levels for more than 100,000 years (Norris et al., 2013). Let me repeat that, 100,000 years! As it did in the geological past, a warmer, less oxygenated ocean will alter marine food web dynamics resulting in reductions of the the productive diatoms which flourish today at the base of the food chain. This change will result in relatively less energy available to support high-level marine vertebrates such as fish and marine mammals and result in profound changes in food web dynamics. Changes in marine ecosystems productivity between now, the geological past, and our likely future. After Norris et al., 2013. Published with permission from AAAS. These global temperature changes of the planet will co-occur with extensive regions of the ocean that will experience a drop in pH (ocean acidifcation) which will reduce the ability of marine life to secrete calcium, a major component of marine skeletons. Ocean acidification with have significant biological effects, including the possible cessation of all coral reef growth (Silverman et al., 2009), and this reduction in pH is predicted to persist for 20,000 years! The bottom line is that a return to a Eocene-like climate will disrupt, or likely destroy, some of the diverse sea life we have come to enjoy which has evolved in our productive seas over the last 40 million years. Critters like whales, seals, seabirds, tunas, and coral reef fish are likely to experience profound change over the next 100 to 1,000 years (Norris et al., 2013). Another temperate region favorite, kelp forests, will likely decline in abundance as climate-driven increases in storm frequency simplify kelp forest food webs (Byrnes et al., 2011). All in all the ocean will experience profound changes for a long, long time. Diversification of marine biota over the last 60 millions years. Most of the sea life we enjoy today evolved under cold ocean conditions of the “icehouse” world we are shifting away from. From Norris et al., 2013. Published with permission from AAAS. 3. Coral reefs will be destroyed. One major fall out from our warming planet will be the loss of coral reefs. We are seeing this now — we don’t need to wait as it is unfolding as we speak — warming events, coral bleaching, rising ocean acidification, rising sea levels. The most complex ecosystems on the planet disappearing before our eyes. Coral reefs, and the surf spots they support, have always depended on a dynamical interplay between reef growth and erosion over 1,000s of years. Tip the balance and reefs erode and fade away, never to be the same. Imagine the loss of Pipeline, Uluwatu, Cloud Break, or Teahupo’o. In 1997-98, during the largest El Niño event so far, coral reefs around the world experienced the most extensive and severe bleaching in recorded history (Wilkinson et al., 1998). Coral bleaching was reported in 60 countries at sites in the Pacific Ocean, Indian Ocean, Red Sea, Persian Gulf, Mediterranean and Caribbean. Indian Ocean corals were severely impacted with >70 percent mortality reported in some places. Some corals older than 3,000 died and an estimated 16% of the world’s coral reefs were destroyed. As the planet warms and these events become more common reefs will likely disappear, as they did in the Eocene 60 million years ago. We may be the last generation to witness pristine coral reefs (Pandolfi et al. 2005). It is hard to imagine but yet it is happening. Our grandchildren will not know coral reefs as we know them today unless something changes. 4. Compassion for others. Of course all of this is very surfer-centric and global warming is having large impacts across the global that affect everyone — which we are just starting to witness. As the world’s population continues to rise, more and more people are living in the coastal zone and exposed to the ocean’s influence and the effects of climate change. Already the list of of island nations threatened with complete submergence in the next 30 years is growing: the Maldives, Kiribati, Seychelles, Solomon islands, Micronesia, Palua, Tuvalu, and the list goes on. What we are seeing now on these low-lying atolls is an early warning sign of what will happen in the future on a global scale. in 2008, Kirabati, a island-nation primarily composed of 32 low-laying atolls, asked Australia and New Zealand for permanent refuge for its citizens from its rapidly submerging nation. Bangaldesh, a country of 156 million people, experiences floods that impact 25% of its country every year and sea level rise is making it worst each year. Many of the countries that are hit hardest are the regions which lack the resources to protect their people against climate-related disasters such as hurricanes, floods, and droughts. These counties are paying the price of the lifestyles of carbon-emitting nations without receiving any of the benefits. This is the much bigger picture of what global climate change will bring and extends way beyond surfing. As global citizens we should care very much about these effects. 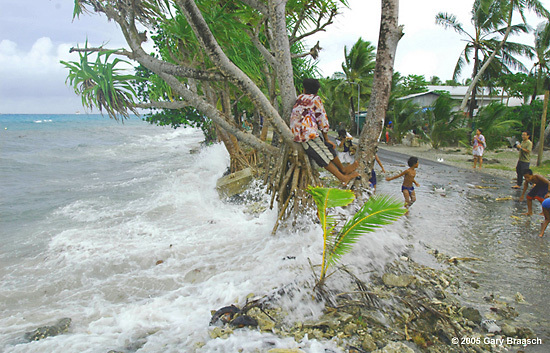 Flooding at Tuvalu. Photo by Gary Bransch. 5. We owe it to the ocean. Surfing has been one of the biggest inspirations of my life. It has changed me in ways I can’t begin to understand: it has taught me respect and patience, kept me in good physical shape, influencing who my friends were and where I lived, focused my interests, and was the inspiration for my career in marine biology. And yet — and this is its charm — it is amazingly free; a pure sport dependent only the wind blowing across the sea and my ability to paddle out and catch waves (I am of course ignoring travel to surf spots and the board itself which can have significant carbon emissions). The ocean asks nothing in return but gives everything. To me it seems disingenuous to not give back to the ocean, to protect her from our effects. Don’t you think we owe that much to the ocean? Look, I have met, or personally know, many of the scientists that have published the research cited in this article. These are world-class marine biologists that are telling us, to the best of their ability, what they think will happen to our oceans. There is no conspiracy here, no clandestine meeting of scientists to scare the world into a Marxist economy. This is the best available science we have at this time and frankly it is scaring me, and I think it should be scaring you too. This is the challenge of our time and its insidiousness makes it all the more difficult to grasp. Things may not change tomorrow, or next year, or even in a decade, but they will change, profoundly, and be felt long into the future and into the next generations. My goal here is not to tell you what to do, you can look elsewhere for that, but please, do something! Joining your local Surfrider chapter is a good start. and with our different dispositions and capacities, our stories are all unique. All have something fresh to reveal. All can help inspire others. Thanks James, I really appreciate the feedback and getting the word out! Well done Brian! Great article. More people need to read this! Excellent work Brian…thank you for all your work and dedication to something that is also very close to my heart. Live long, live well Dr Abalone.